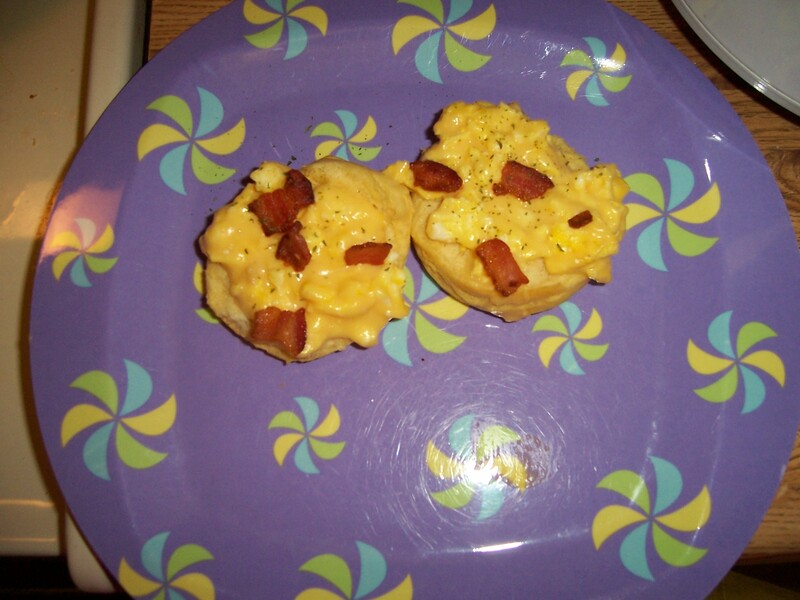 Recently, I ran across this slightly sweeter breakfast variation on Pinterest. I cooked up a batch for Jeremiah and I on Tuesday morning. Delicious and filled us up until lunch time. Perhaps you could cook up a batch for your family over the Christmas break. Cook scrambled eggs and sit to the side. In a pan or microwave dish, melt the butter, Worcestershire sauce, and syrup together. Meanwhile, slice rolls in half. Spray a 11 x 7 pan with non-stick spray. Place the bottom halves of rolls in dish. Top with half of butter mixture. 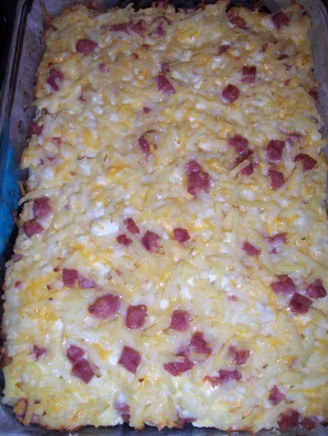 Cover with ham, cooked scrambled eggs, and cheese slice. Top with remaining bun tops and press down into pan. Brush remaining butter on top of buns and sprinkle with poppy seeds. Bake at 350 degrees for 15 minutes. Not sure what to do with that leftover Easter ham? Here is a make-ahead recipe that you can throw in the oven while you are getting ready for work. Mix all ingredients. Pour into greased 13 x 9 pan. Refrigerate overnight. Bake at 350 degrees for 40-45 minutes. I used about ¾ of pound of ham. I thought it was plenty. I used low-fat, small curd cottage cheese. I used 1 ¾ c. cheddar cheese and 1 c. Swiss cheese. I didn’t miss the ½ c. of cheese. I also used 2% cheese. I used about ½ onion. When diced small enough, you can’t even taste it. I had to bake it for 1 hour to fully cook the egg. This recipe came as a recommendation from my friend Theresa. It’s a Weight Watchers breakfast recipe. I’ve made a lot of egg recipe over the years and many times, they start to taste the same. 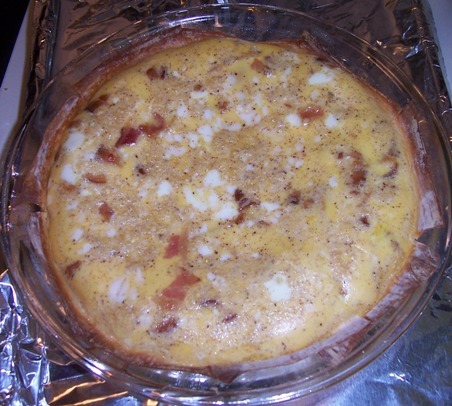 This one is a little different mixing evaporated milk, egg substitute, Swiss cheese, and turkey bacon. But nutmeg is the secret ingredient that gives this recipe its flavor. If you are trying to watch what you eat, Phyllo Dough is one of the best crusts you can use. I like to buy Wonton Wrappers since they work pretty much the same. In case you aren’t sure where they are located in the grocery store (I didn’t know and had to ask when I first started using it), they are by the fresh fruit and veggies in the refrigerated case. Preheat oven to 350 degrees. Spray 9 inch pie plate with nonstick spray. Line dish with dough. Spray with cooking spray. Whisk together all ingredients except cheese and bacon. Sprinkle with cheese and bacon on dough. Pour egg mixture over. Bake on baking sheet for 30-35 minutes. Cool 5 minutes. Cut into eight wedges. Each piece is 3 Weight Watchers Points. I used Wonton Wrappers instead of phyllo dough. I layered it in the bottom of the pie dish. Just be sure to cover as much as possible it you don’t want a crunchy crust. I also tried to make it in a muffin. Crust is definitely crispier. But you get to eat two pieces for 3 WW Points and it only takes 12 minutes to cook. A messy muffin tin is also a minus to doing this. I used fat free cheddar and low sodium bacon when baking one time. I tasted just fine. I ran across this recipe on Kraft Foods website. It reminded me of a warm chicken salad. Mix all ingredients in a 2 qt. 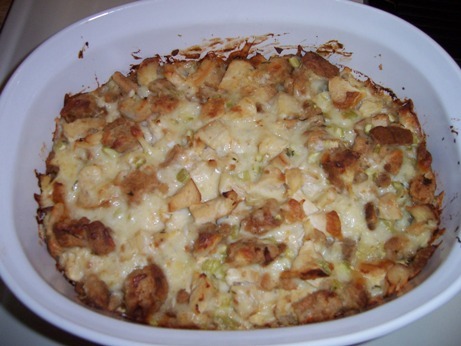 greased casserole dish. Bake at 350 for 40 minutes. Makes six servings. Save 40 calories and 4 g. fat per serving by using 2% cheese, Light Miracle Whip, and skim milk. I used boneless, skinless chicken breast which is healthier. I also made my own croutons which allowed me to decrease fat and increase fiber. Although I did not add it, some almond slices or dried cranberries might be a nice addition. When I get really tired of making the same thing, I will dig through my recipe books for something new. You can’t go wrong when you mix cream of chicken, scrambled eggs, and Swiss cheese together. The only thing that makes this recipe even better is the crunchy bacon bits are sprinkled on top of it. So if you like biscuits and gravy, give this recipe a try. Bake biscuits according to recipe. Meanwhile, beat eggs in a medium bowl. Add onions. Melt butter over a medium heat. Add egg mixture and cook til almost done. In a small bowl, combine soup, milk, cheese, and pepper. Add to eggs in skillet, stirring occasionally. Cook until thoroughly heated. Spoon over open biscuit and sprinkle with bacon. Nutrition Facts (based on original recipe): Makes four servings. 550 calories, 34 g. fat, 13 g. saturated fat, 360 mg cholesterol, 1,560 mg sodium, 33 g. carbs, 7 g. sugar, and 28 g. protein. 24% vitamin A, 40% calcium, and 14% iron. I used Healthy Request Cream of Chicken soup to reduce fat and sodium. I always use skim milk, use reduced fat/fat free cheese, and omit the butter. This helps decrease fat as well. I serve this with small reduce fat biscuits (8 count refrigerator biscuits), making more servings (decreasing amount of calories and fat consumed). You can use a reduced sodium bacon or turkey bacon. This will decrease both sodium and fat content. I usually sprinkle parsley on top of this dish. I consider the onion optional in this recipe.